In any case, there is confusion between the types of threads, from country to country, because they’re called different things. So I’m going to refer to the threads as I know them and explain their properties here, so that you can tell the difference between them and perhaps find them in your own country. You can at least know what I’m talking about when I use the names of the threads. The ultimate point I want to make here is that coton a broder and floche are two distinctly different threads. Let’s look at them. We’ll start with a skein of coton a broder, or broder special. Properties: cotton; non-divisible (you use the thread just as it comes off the skein; it can not be broken down into smaller usable threads); 4-ply (that is, each strand is made up of four smaller plies of thread twisted together to make the one usable strand); mercerized (has a sheen); comes in various sizes or thicknesses and these are delineated by a number assigned to the thread size; only some sizes come in colors beyond white and ecru; it is also called “cutwork thread” or “whitework thread” because it is used (usually in white or ecru) in cutwork and whitework. Size 25, shown here, comes in some 180+ colors in the States. The thread is not carried by DMC USA per se (you won’t find it listed in the products on their website), but retailers can buy it through certain DMC distributors. Size 25 is normally coded as product 107 (or Art. 107) in DMC catalogs, color cards, and so forth. Above, size 25 (in blue) is lined up next to size 16 in white. The size number is indicated on the longer label. Size 16 is significantly heavier or thicker than size 25. So, when it comes to sizes within the same line of thread, the lower the number, the thicker the thread. Now let’s add some floche into the mix. Properties: cotton; non-divisible (just like coton a broder, as explained above); 5-ply; mercerized; comes in one thickness, which is assigned a number, but which does not correspond with the same number in other lines of thread. On the label, floche is called “coton floche a broder” and it has a size number, which is 16. And this can cause confusion, so we’re going to clear that up below. When coming directly from the distributor, floche comes in large 10 gram hanks. Some shops may break these down into smaller put-ups to sell. 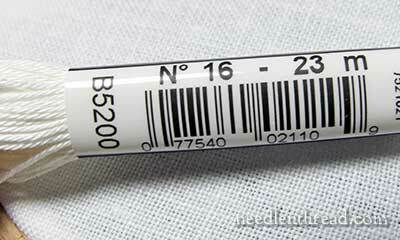 Here in the States in DMC catalogs, color cards, and the like, Floche (or Floche a Broder) is usually given the product code 5238. In the photo above, starting at the top, we have a hank of floche (the size number on the label is 16), followed by a silver coton a broder 25, a white coton a broder 16, and a blue coton a broder 25. 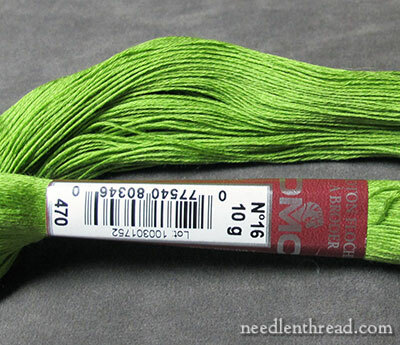 The top green thread is floche, which has the size number 16 on the label. The two lower threads are coton a broder. The middle thread is size 25. The lower one is size 16. You can see that size 25 coton a broder corresponds more closely in size to floche. You can see that size 16 coton a broder is quite heavy compared to the other two threads, and does not at all correspond to floche marked with size #16. And now let’s look at their structure. Remember that both of these threads we’re talking about – coton a broder and floche – are non-divisible. You don’t take them apart to stitch with them. But we can separate the plies a little bit, to see how they are constructed. 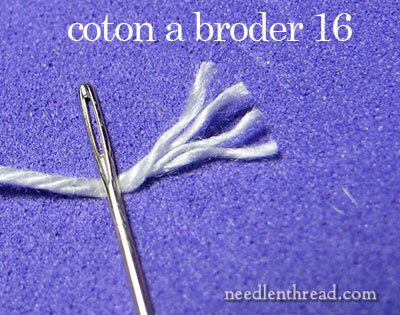 Coton a broder 16 is made up of four plies twisted together to make one non-divisible thread. 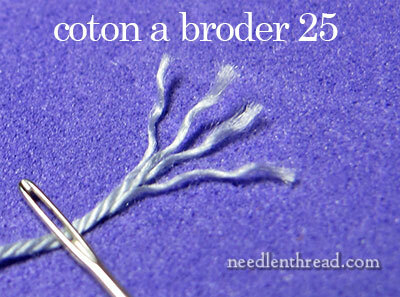 Coton a broder 25 is made up of four plies twisted together to make one non-divisible thread. They are both the same construction, just different sizes. Floche is made up of five plies twisted together to make one non-divisible thread. Floche is not as tightly twisted together as coton a broder, so it is a slightly softer thread when you stitch with it, and it has a bit more “spread” to it. Here they are: coton a broder 25 on top, with the green floche right below it. You can see that the twists on the green floche look longer than the twists on the coton a broder, because the floche is not as tightly twisted. At the base of the photo is coton a broder 16, which is significantly heavier than both of the threads above it. If you are looking for a thread to substitute for floche because you can’t find floche, please don’t try to substitute coton a broder (broder special) in size 16. Instead, substitute coton a broder (or broder special) in size 25. The actual thickness of the threads will correspond better, and you’ll have a much better color selection. We’ll look at some stitched comparisons later this week! Questions? Comments? Suggestions? Have your say below! Would these threads be good to work alternating chain stitch with? And how much do they cost? Very, very good explanation and just in time – I’ve read some very confused questions and answers about these threads this week. Thank you! Having never used either of these threads I find this a most helpful tutorial! This is just the kind of post that keeps me coming back to your blog day after day. I have learned so much about threads I have never used which is very helpful when planning a new project. Thank you! Thank you so much for providing education about embroidery threads. I had no idea that there are so many variables in threads but learning about them will help me make better choices in thread selection to enhance my embroidery. Keep the information coming, please! Thank you again. Thank you for trying to unconfuse me on these threads. I’ve read your article twice and will print it our for more study. Mary, Thank you for this article. Would using different threads, Coton a Broder and Floche and/or DMC floss in the same design look right or just muddle the design? Thank you Mary – another very informative and useful article! You are simply one of the most didactic people I have ever observed, as well as extremely talented, but above all what I most like about you, is your generosity. The World of Embroidery is much richer because of you. I am grateful that you are on this Planet. Great explanation even for me (I don’t speak english…). Love this article. No one else (that I know) does this sort of comparison. I am very much enjoying your articles from the coloring book. Thanks for doing this! 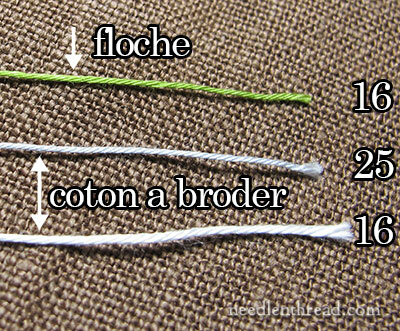 This is a great blog and really explains the difference between Floche vs Coton broder, they look very similar but when put together you can see there is a difference and I should imagine there’s a difference in texture as well. 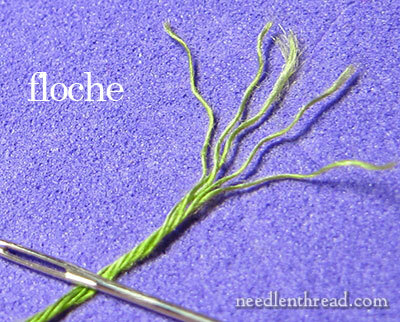 I do have some floche thread which I use sparingly because I can’t buy it in the UK. Thank you so much for explaining and defining the difference between the two thread and sharing with us your observations on these threads. I love to embroider with floche so watch for sources as I cannot buy it locally. Occasionally I have found floche on EBay. At one time DMC must have been made floche in sizes other than No. 16 as I have skeins from No. 14 up to No. 8. The skeins are all obviously old. Most accompanied pieces of stamped linen for cutwork. I believe the linen dates to the 1930’s and 1940’s so assume the different sizes of floche do also. Thank you, thank you, thank you. Best every explanation on these threads. I went back and looked at my thread. I did not have Coton a broder but Floche! Now I know why I was so confused about the size difference. I have the Lattice Sampler but have not started on it as yet. I have a local source for the Coton Floche with lots of lovely colors to choose from. Could I substitute the Floche for the Coton a Border to stitch this sampler? Finally a concise explanation on the two threads in one article. I will save this one and the others as they are available. Thanks for a wonderful site. I do not do embroidery but find the subject fascinating. Thank you for this great explanation. I always learn so much with my visits here. It seems as though there would be some standard for threads to be classed in….all #16 threads would be a certain gauge…especially when they are all from the same manufacturer. THANK YOU! Coton a broder and floche are not available at my local stitching shops. Except for reading about them on the internet, I have no idea of what they are or how they differ from pearl cotton or stranded cotton. It is so good to learn more before spending money and waiting for mail order supplies without even knowing what you are getting yourself into! I can’t wait to see them stitched up. Can you show them next to pearl cotton and stranded cotton for those of us with limited pallets too. I’ve enjoyed seeing the difference in the stitching on the hummingbird project already. This is so timely for me as I am gearing up to perfect monogramming and you have cleared up the difference! So for a linen guest towel primarily in satin stitch I want floche 16 or coton a broder 25? How do these threads compare to perle cotton? I love stitching with it much more than floss. Thank you. This has been very educational. I love getting this kind of information. Someday, I hope to try these threads on grander projects than embroidering my granddaughter’s clothing. I remember years ago seeing a discussion of this on Compuserve. Borrr-r-r-ring! Nobody really had the whole picture. As Karin put it, you are a gift to the planet. It took energy to explain this! Thank you, Mary! Thank you Mary, this has been a really helpful article today. I’ve been keeping an eye out for floche threads ever since you started mentioning them, but I’ve not been able to find a supplier in the UK. I thought I’d found one recently, but the thread described as ‘floche’ actually turned out to be DMC Coton Retors Mat No4 (also called Soft Embroidery Cotton here). Is floche thread only made for the American market, because I haven’t found a European supplier either? It was very useful to see the comparison threads in close detail. I’ve been trying to weigh up whether to order floche from abroad or find a substitute thread locally. I can now see why the softer floche would spread very nicely when used for satin stitch, and it’s nice to know that Coton a broder 25 (which is available here) would be a very close substitute. Thanks Mary for the timely advice; I look forward to the stitch comparisons later on. Here in Montreal (Quebec), Canada, I was told that DMC no longer produce Cotton floche and that what we buy is the remains of the stock the store still have. I tried to have more info buy writing directly in French to DMC in France. They referred me to DMC of North America, but I got no answer to my inquiry. Do you have more information about that situation? Thank you so very much for this information. The way you describe the different threads,along with the pictures,just makes it so clear. This article is a prime example of why your blog is the best Mary. Your knowledge, expertise, personality, and generosity shine through. 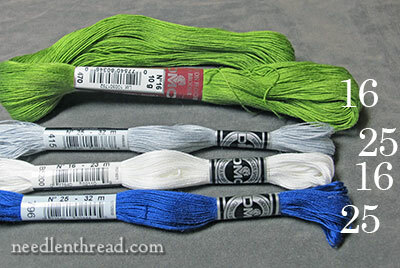 Could you compare the regular dmc floss and perhaps others like perle cotton and crewel wool? It could be a whole series! Youve already started it with some good articles just need to link em. Yes, I’ll make further comparisons later in the week! Thanks, Veronica! Thank you for the comparison between the two threads, and where they can be obtained. My first question is: does the non-divisable coton a broder in size 25 compare to Perle Cottons, tatting cottons or crochet cottons in similar sizes? 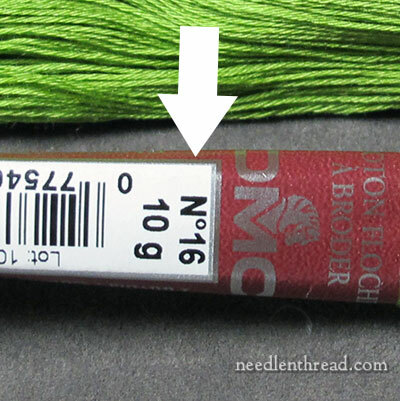 Secondly, does the non-divisible coton a broder in size 25 equal one strand of DMC embroidery floss? Thank you so much Mary this was so interesting and easy to understand .You really have a gift for explaining things . Now a problem Floche and coton a broder seem thin on the ground here in Queensland if any of your Australian followers know where to purchase same would be grateful. I do have a lot of regular DMC stranded embroidery thread but had not heard of the two above mentioned also have used perle DMC thread , once ah pagan thank you for your brilliant tutorials and sharing your projects. Thank you Mary! What a great explanation. 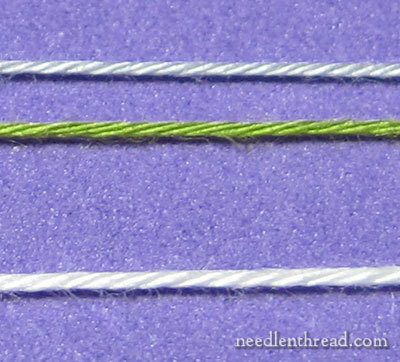 It’s hard to keep everything straight when there’s so much to know about thread comparisons. I have rarely met a thread I didn’t like–but–it never really registered that the construction & the twist made such a difference in embroidery performance until I started making lace. That was then & this is now, so I consult my “Threads for Lace” book before selecting threads. Also, I wanted to mention that I believe that Marion Scoular uses floche for blackwork in color & her results are far superior to floss. Hi Mary, thanks for the informative post on a confusing subject! I was wondering how perle cotton fits in? They’ve got a lot of perle cotton (or coton perle as it says on the label) in Joann/Michael’s but I can’t find much info on it on the embroidery blogs I follow. This is a very clear picture of the differences in the threads mentioned. Thank you, Mary, for your wonderful post. Ah, that clears up some questions I’ve had. Thanks, Mary! I never fail to learn something useful from your posts. I hope you’re all stocked up and ready to burrow in for a few days, another snow-mageddan is moving in. Or possibly just a little snow and a lot of hyperbole from excitable weather people. Either way, don’t you just love sitting in a snug house, peacefully stitching while the weather rages outside? It’s one of my most favorite things to do. Outstanding. Decade or so ago we had to use #12 and #16 for Ukrainian embroidery based on traditional patterns for an EGA group correspondence course and I was delighted it came in colors beyond white and ecru. Then when experts kept talking about using Floche for better techniques of monogramming and whitework techniques, I sought that too. But there was real confusion about whether Floche was the #25 and your feature here will be my guide. Thanks ever so much for the detailed visual comparisons & info. 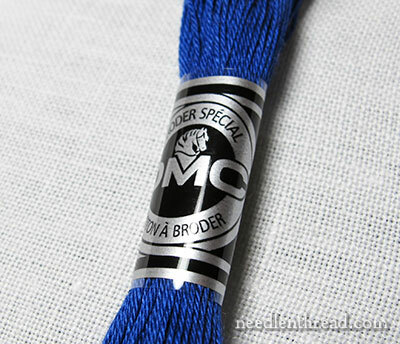 I have another type of “broder” floss called Retors a Broder by DMC. It’s labeled No. 4, 10 metres coton, made in France. I was given a large selection of colors – very bright and beautiful! It has 5 strands and does not seem to be divisible. It is non-mercerized so is very matte – with a very soft appearance. What type of needlework is this used for? I’ve never seen or heard of it before. Thankyou so much for giving out such wonderful informations from time to time, it shows your dedication to your work and how committed you are to teach others.There is so much to learn from you. I am so glad I have subscription to your site. Ah, you’ve cleared up a mystery for me, thanks very much! Wonderful article, Mary, and you did an excellent job of explaining the difference between the 2 threads. Some one asked about the price – the skeins of coton a broder are usually about $1.50 / skein and the skeins of floche are $6.30/skein. This may sound like floche is a bit more expensive, but in reality, the coton a broder#25 skeins have 32 meters and the floche skeins have 150m, so the floche is actually a bit less expensive, when you price it by the yard. One other thing, for you novice floche users! If you are opeing a skein of floche, keep in mind that it is wound like an old hank of yarn. If you startpulling on one thread, it will make a huge rat’snest and isnext to impossible to get undone. If you take off the label and look towards the top of the skein, you will see a little know in the floche – this is the end that is tied around the skein. Carefully clip the little knot and then take scissors and cut through the whole skein. This will give you a 54 inch length of floche. Unless I am using it for something that I need to have a long piece for, I then divide the floche into thirds and cut, giving me 3 – 18″ little hanks of floche. I make a soft knot in each little hank to keep them from falling apart. I put the color # on the outside of a ziploc bag with a Sharpie and then store the floche inside. Both of these threads are wonderful to work with! 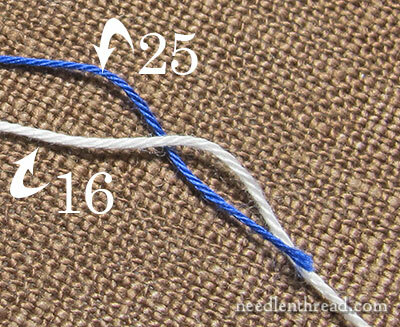 Forgot to add – both the coton a broder #25 andthe floche are equal to about 1.5 skeins of regular stranded floss. When smocking, we udually use three strands of stranded floss, but 2 strands of either floche or CaB #25 are about the same as 3 strands of stranded floss. A final thought and then off to bed……… floche is used for almost all of the embroidery on the island of Madeira. The first time we wnet to one the Imperial Bordados factory (sadly now closed), it was before floche was readily available in the U.S. On the first day when we went to upstairs in the factory for our classes, they opened a big antique armoire and it was full of all different colors of floche. They use if for their cutwork, padded satin stitches, bullions, granitos, etc. Thank you for clearing my initial confusion. This post is absolutely brilliant! Thanks so much Mary. So very informative and very understandable now. Thanks for this really useful information. I didn’t realise that there was more than one choice of this type of thread – thank you! Thank you, Mary. Excellent explanation. Mary, I accidentally came across this supplier of floche in white only it seems in France. I have placed an order for a couple of skeins of 10g at Euro 4,80 per skein. I found your recommendation of this thread for monogramming and have desparately wanted to try a monogram after building myself an inspiration board of monograms on pinterest. PS – I adore your newsletters – real proper embroidery. I can’t tell you how excited I’ve been about your posts recently. I have been wanting to ‘graduate’ from embroidering tea towels with a few simple stitches to something a little more serious, but I didn’t know precisely where to begin. Sorry, didn’t mean to submit just yet. I’m anxious to begin a more ‘serious’ project from your Church Embroidery book. Can’t wait! This was a great explanation of the two threads, I do not have access to the “coton a broder” fibers, they look lovely. I do however carry the full line of the Floche in my shop in Cincinnati. Can you give me a source for the coton for purchase for my shop?? I do see that it is a dmc product, however all of my dmc suppliers do not seem to carry it as yet….. I live in England. When I Googled ‘cotton floche’ I was directed to a usually reliable needlework site. On this website, ‘cotton floche’ was interpreted as ‘crochet cotton’. The label is “DMC Natura Just Cotton’. Although it can be divided (into 7 very fine strands) it clearly is meant to be used as a whole thread. I don’t think it IS ‘floche’ at all. What is it? And what should I be asking for over here? Thanks for explaining the difference between coton a broder & Floche. Could you please tell me what the difference is between coton a broder & Baroque (dmc-usa) crochet cotton size 10 (Art 159)? Thank you for this series, I am finding it fascinating. My sister in law introduced me to your site, I’m very glad she did. My question is, is the floche thread possibly what I know as flower thread here in the UK. Flower thread here in the US (often sold as “Danish flower thread”) is a matte thread – there’s no sheen to it. Floche is mercerized, so it does have a sheen. There seems to be some confusion between the names of the threads, as I have seen that some teachers and authors from South Africa, from the UK, and from Australia call different threads different names. But if you go to the source of the threads – the original “Danish flower thread” originally dyed by Einar Hansen, for example – it was a matte thread, without a sheen. 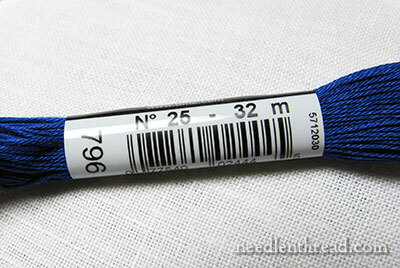 Floche, a product of France, is a mercerized thread with a sheen. 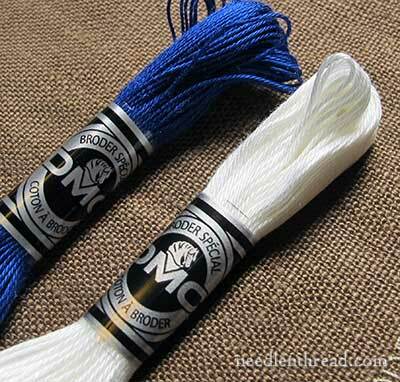 Coton a broder (which is another thread whose name is sometimes confused with flower thread) is a mercerized thread in most countries, including the UK (it is used for whitework – you can check the RSN essential guide to whitework and they have it listed as such in there). So I think flower thread, if considered correctly, is a matte thread, whereas floche has a sheen to it. Hope that helps a little…though it all sounds rather confusing, doesn’t it? Could you please tell me what the difference is between coton a broder & Baroque (dmc-usa) crochet cotton size 10 (Art 159)? This comes just at the right time for me as i’m gathering my supplies to make the crazy quilt “peacock” square from Pamela Kellog’s Kitty & Me blog site. I want to embroider the body of the bird in long and short stitch and even though she used rayon thread for the sheen it has, which I had intended to use,I’m going to try to use the floche. First because I think it will look more lifelike, and second, because I feel it will cover up any less than perfect stitching on my part. Where can I purchase DMC floche in smaller yardage than Hedgehog handworks website has? Hi, Sarah – did you see the smaller put-ups that Hedgehog sells? They are thirty yard twists, rather than the 168 yard skeins. This is a link to them: http://www.hedgehoghandworks.com/catalog/FBRFABT.php Floche comes from the supplier in the large skeins or hanks (168 yards), and Hedgehog breaks them down and sells them at a fraction of the price. I haven’t found floche available elsewhere in all the colors available, in smaller put-ups. Very clear explanations. I am using a netting pattern found in The young woman’s book: a useful manual for everyday life, an book published in 1877. The instructions call for both cotton, boar’s-head #60 and French embroidery cotton. Do you have any idea what would be a comparable thread. Hi, Rita – You might look up Marie Suarez’s whitework embroidery – she is located in France. She has some specialty threads produced for whitework, some of which are the higher numbered cottons. I have always used 6 strand embroidery floss, several years ago, at a quilt show, i purchased a redwork pattern and the vendor suggested that i try an alternate type of thread, it is equivalent to X number of embroidery floss, i purchased 1 spool and loved using it. i lost the spool and cannot remember the name of the thread, type of thread or any distinguishing criteria. i would love to purchase additional spools, and hopefully find the dark red to finish the remaining blocks for the second project that i started, could you help. i know that the local fabric shops (Joanne’s or Hancocks) in the small town that i live in do not carry the thread, i tried to order it from an internet source, but cannot find an embroidery thread that comes on a spool. cant remember vendor, pattern name is incomplete on my project. Hi, Bobye – You’re probably looking for Cosmo’s multi-work thread. Just Google “Cosmo multi-work embroidery thread” and you’ll surely find some online resources that sell it. It’s two strands of floss that come off the spool together, and it comes in a somewhat limited palette of colors. It’s great for redwork and the like. Hope that helps! Mary, your article of Feb. 2014 on selecting threads is, as always, totally informative. I may be way off-base… a hair-pulling feeling… but have you entertained the thought of doing a simplified chart of all of your thread comparisons (perhaps a PDF file for a nominal fee) thus eliminating the scrolling up and down when following/reviewing your comparisions? I ask this only because I do rely on your knowledge as I strive to learn “forever” the art of selecting threads. Perhaps there is an easier way of charting your info that I could do myself, but haven’t thought of (or maybe a cut n paste method)! How do you store the 10g hanks of coton floche a broder? I know at one point you were using a hanging system that was stored in a file cabinet. I’ve received some Hanks and have more on the way so I need to find a system. I have two sets of Bisley drawers, file cabinet drawers, and a chest of drawers. But not living in the States, it sometimes takes a while to get things. Suggestions? Hi, Barb – My hanks of floche are all tidily stored in my Bisley cabinets. They certainly take up more space than normal skeins of thread, but since I don’t go through them very quickly, it’s nice to have them laid out in drawers where I know they will be safe for a while! Are there specific projects where you choose one over the other? This is my big problem…I’d like to try them all, but always womder what I should use for which type of project. …..And silk! When does one turn to silk? Coton a Broder 25 is hard to find in my area. Can I substitute DMC floss. If yes how many strands. I’d substitute 2 strands of floss for Coton a Broder. Your comments regarding cloche and coton de broder remind me of sashimi thread used in Japan and here for born/shashiko stitching. How does this thread compare with the two threads you mentioned in your newsletter (or blog?)? I have been using it for boro stitching and also for couching (the shashiko thread being held down by lighter weight thread—probably by split embroidery strands). Floche and coton a broder differ from sashiko thread in that sashiko thread is not, to my knowledge, mercerized. I believe it is a matte thread without a sheen – like Danish flower thread. If it is mercerized, it’s still not got the same sheen as coton a broder and floche, so there is something definitely different in the manufacturing process. I don’t know if the structure is similar to coton a broder (it looks more similar to coton a broder than to floche) – I’d actually have to take the threads apart and compare them – but they are all three similar insofar as they are used straight off the skein and not meant to be separated into finer strands.